NATO Secretary General Jens Stoltenberg said that the bloc will be watching very closely the upcoming Russian-Belarusian military exercises dubbed Zapad-2017. NATO will be closely watching the upcoming Russian-Belarusian military exercises dubbed Zapad-2017, NATO Secretary General Jens Stoltenberg said Friday. "At last month’s meeting of the NATO-Russia Council, Russia briefed on the ZAPAD exercise 2017. And we will be watching very closely as it takes place next month. All nations have the right to exercise their forces, but nations should also respect their commitments to transparency," Stoltenberg said during his Polish visit, as quoted by the Alliance's press service. The NATO chief called on Russia to ensure transparency and to adhere to the Organization for Security and Co-operation in Europe’s (OSCE) Vienna Document on security-building measures. The joint drills will take place on September 14-20. 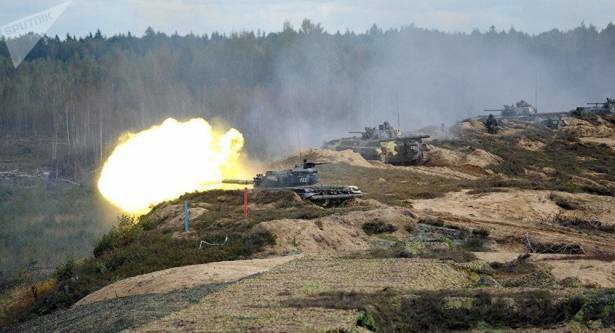 The exercise grounds will stretch from the Kola Peninsula in Russia's far northwest to Belarus. The Vienna Document, adopted in 2011, aims to reinforce security measures in Europe and envisages the Organization for Security and Co-operation in Europe member states providing each other with information on their armed forces, defense planning and military budgets, as well as exchanging military observers and inspections.